It looks like Five Finger Death Punch’s Ivan Moody has been performing with a broken foot on the band’s current tour. There isn’t much info on the injury, but Zoltan Bathory has been calling him “Mr. Broken Foot” and he has also been wearing a boot. During Deftones’ April 29 show at Groezrock in Meerhout, Belgium, frontman Chino Moreno broke his foot after falling off the stage. As a result, the band cancelled tonight’s (May 1) performance in Koln, Germany. Regretfully, we have to cancel our show tonight due to Chino breaking the top of his foot. He needs to stay off it for the next day or two. No other shows as of now are in jeopardy of being cancelled. We hope to make it back soon to perform for you again. In the meantime, all tickets will be refunded. Thanks for your understanding. Last night (July 16), Megadeth’s David Ellefson broke his foot before the band’s planned set at the Rockmaraton Festival in Dunaujvaros, Hungary. As a result, that performance was cancelled, along with the remaining dates on their European tour. “The bassist has a foot bone fracture and Megadeth are unable to perform. 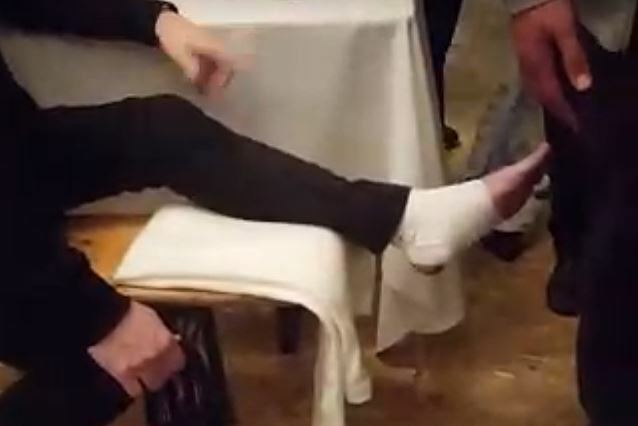 Organizers immediately called an ambulance and Ellefson was transported to St. Pantaleon hospital where his foot was placed in a cast. Despite the injury, he was in a good mood and was taking selfies with the paramedics on the way back to the venue when it still seemed that the band would perform.